When you come to La Jolla Dental Care in northern San Diego for cosmetic dentistry, you can be certain that you will get the best of care. Dr. Charles Briscoe has been artistically creating beautiful smiles for more than 3 decades, and his patients love their transformations. It is his attention to detail and exceptional care that has earned him the reputation as the best cosmetic dentist San Diego has to offer. Watch this video interview with Dr. Briscoe, and learn why he has earned an award as one of best cosmetic dentists in San Diego & La Jolla five years in a row! You know that your smile is important. A wide, open smile makes everyone around you comfortable, and lets them know that you are friendly and easy to be with. Nonetheless, many of us are unhappy with our smiles. Are you someone who tries to hide your smile instead of showing it off? If so, you may be giving people the wrong impression about yourself. You may appear stern, unhappy or aloof. For people who earn their living through sales or other public contact, having cosmetic issues with your teeth can have a detrimental effect on your success. Cosmetic dentistry at our La Jolla office encompasses the full spectrum of procedures including our simple San Diego teeth whitening, straightening misaligned teeth, replacing missing teeth with implants, chair side crowns and creating a dazzling smile using porcelain veneers. 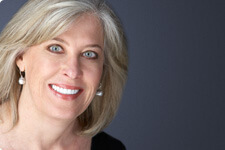 Many top real estate professionals and others call Dr. Briscoe the best cosmetic dentist in San Diego. Their million dollar smiles are a testament to their praise. Patients who have finally decided to correct that introverting smile are completely thrilled with their results as evidenced by the dramatic before and after photos that patients can view. Many bring their spouses, friends or children in for evaluation and treatment so they can also experience the relief of finally being able to laugh at jokes without hiding their full smile. Cosmetic dentistry has advanced at a breathtaking rate over the past few years. 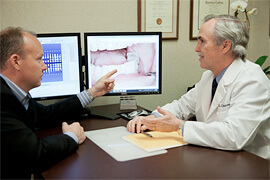 Now, it is possible to have multiple procedures done during one visit even for the most anxious patients. This is due to one very popular advance in the administration and monitoring of conscious dental sedation. Anxious patients need not worry or lose sleep over their upcoming dental procedures. After having cosmetic dentistry in the La Jolla office, patients report that they feel extremely relaxed and that they have little to no recall of their treatment. Dr. Briscoe and his team have undergone extensive training in what is termed conscious sedation, insuring patient safety and comfort during treatment. The benefit of having multiple procedures during one visit is appreciated by those who have little time to spend getting their dream smile. Using state of the art equipment and the latest dental techniques, it is possible to correct a lifetime of anguish over dental faults in just a week. La Jolla Cosmetic Dentist, Dr. Charles Briscoe would like to let you know that you don't have to go through life with a smile that you don't want. With modern technology and his very able artistry, you can have the smile that you have always wanted. It doesn't have to hurt, and it doesn't have to take forever. If you are in a hurry, Dr. Briscoe can completely transform your smile in as little as one week! A Smile Makeover can be as simple as professional Teeth Whitening, or it can mean a series of procedures to change the shape and size of your teeth as well as their color. In a thorough consultation, San Diego Cosmetic Dentist, Dr. Briscoe can help you to decide which of our procedures is right for you. With the revolutionary KOR process, you can get true professional dental whitening that lasts a lifetime. Call us today to schedule an appointment for the finest teeth whitening San Diego has available! Transform your smile in just two or three visits with beautiful, durable porcelain veneers. Replace chipped, stained and even crooked teeth. For many patients, porcelain veneers and crowns can be used to transform twisted, overlapping or crooked teeth into a straight, perfect smile. And Dr. Briscoe can do it in just one week! You can straighten your teeth without metal braces, using removable plastic aligners that gradually move your teeth to their new positions. 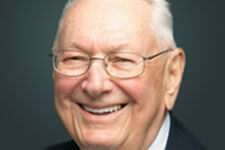 Are dentures or missing teeth keeping you from enjoying life? With dental implants, you can have comfortable, permanent replacements. With clear braces from Six Month Smiles, Dr. Briscoe can help you straighten your smile in just six months. "I have always had problems with my smile. When my dental work from a previous procedure at a different office began to deteriorate, I sought to correct my smile permanently. My journey led me to Dr. Briscoe's office. "When I met with Dr. Briscoe, he helped me to see the big picture — not just the immediate results of a beautiful smile, but the lifelong effects of a healthy bite. "He fixed everything, and my teeth are so white now! I have gained total confidence in my smile, and I am so happy with everything. "I would tell anyone to come to Dr. Briscoe to receive the best care possible." How do you know if Cosmetic Dentistry is right for you? The best way to find out if you are a candidate for Cosmetic Dentistry is to schedule a consultation with Dr. Briscoe. In a cosmetic dentistry consultation, you can ask all of your questions, find out which procedures could give you the most benefit and learn why his patients call him the best dentist San Diego has available. You wear dentures and are frustrated or tired of the goo, the pain and the embarrassment of teeth that can literally fall out on your plate. In a Cosmetic Consultation with San Diego Cosmetic Dentist, Dr. Briscoe, he will examine your smile, and answer all of your questions about how to improve it.